To help prevent families from prematurely needing my services, I try to create awareness of situations that could potentially be lethal. Canine bloat is one of those conditions. Canine bloat (also known as Gastric Torsion or Gastric Dilatation Volvulus - GDV) is an extremely serious and life-threatening problem. It usually appears suddenly and progresses very quickly, often with tragically fatal results. Bloat tends to strike large and extra-large, deep-chested dogs, such as Rottweilers, Great Danes or Irish Wolfhounds more than it does medium or small breeds. However, no breed is 'immune'. Knowing how to recognize the symptoms of bloat (and knowing what to do next) could literally mean the difference between life and death for your dog! Since a picture is worth a thousand words, below is a video showing a dog experiencing bloat (this dog did survive) - it is graphic so skip the viewing if this would be upsetting to you. This is a FREE class however a reservation is required. Unfortunately pets pass without regard to the calendar or the clock. I am here to provide you with answers to your questions about your pet's cremation as the need arises. The phone answers 24 hours a day, 7 days a week. If the message responds, please leave your name, your pet's name and breed and whether your need is immediate. Your concerns are important and your call will be returned. 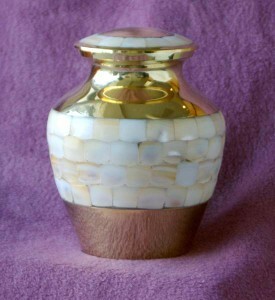 The beauty of a classic brass urn embellished with four rows of small tiles of mother of pearl. The iridescence of the pearl catches light and warms the brass. Hand inlayed, each urn has the distinction of being unique in its own way, just like your beloved pet.